You are here: Home / How to / iTunes Backup Password: What Is It? How Can You Change It? 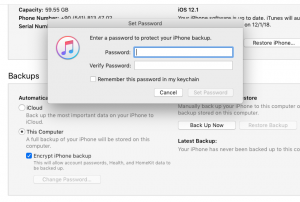 To protect yourself, you can use password protection and encrypt your backups in iTunes. This will let you secure your personal information. 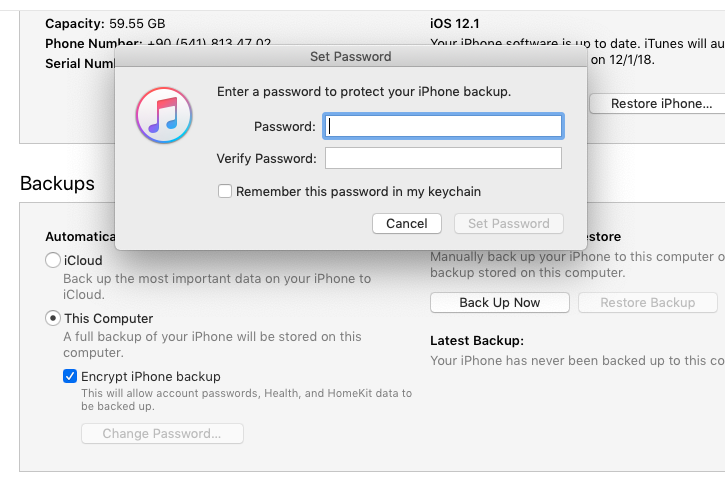 In this article, I explain what is iTunes backup encryption, how you can disable it and what you can do when you forget your password. You need to connect your device to your computer with your USB cable, so it is not wireless. As stated above, your backups in iCloud are encrypted. However, by default, iTunes backups are not encrypted. You can also encrypt your iTunes backups. If you are backing up Health, Activity and KeyChain data, you will have to back up with a password meaning your backup will be encrypted. You may also want to choose encrypted iTunes backup to add additional layers of security. So, when you lose your computer, people will not be able to access your iOS device backups saved on your computer without your password. See also: iTunes not responding? Under the Backups section, check the box for “Encrypt iPhone (or iPad) Backup”. You will be asked to create a password (pick something easy to remember, do not forget this, if you do, your backups will be useless, you may want to check the “Remember this password in my keychain” box). Note that when you create a password, iTunes will also encrypt your previous backups. Now when you want to restore or disable this, you will be asked to enter this password. If you want to disable encryption, you can do so easily. Connect your device and launch iTunes and then simply un-select the “Encrypt iPhone (or iPad) Backup” box. Note that you will have to enter your password (that you created when you enable this). See also: iCloud is full? Try to guess your password. You will have unlimited attempts. You may try common passwords like 1234567890 etc. You can create a new iTunes backup (old encrypted ones cannot be restored without the password). On your iOS device, go to Settings > General > Reset > Reset All Settings and reset your settings. You will need to enter your iOS passcode. This will remove the encryption. Then you can create another iTunes backup, encrypted ot not. Note that Reset All Settings will not remove any data instead some of your settings, wallpapers, brightness, etc, will be lost.